This project won first place in Metals in Construction Magazine’s 2018 Next-Generation Facade Competition, an open, global competition formed to generate ideas for a facade system that can play a major role in enhancing employee health and well-being. Our vision asked "how can we use ecological systems in lieu of mechanical to create a 21st century workspace?" The World Health Organization defines health as a “state of complete physical, mental and social well-being and not merely the absence of disease or infirmity.” Conventional, contemporary building facades isolate occupants from the outdoors and provide visual connections only through glass - often to the detriment of both providing a range of thermal comfort and maximizing energy efficiency. 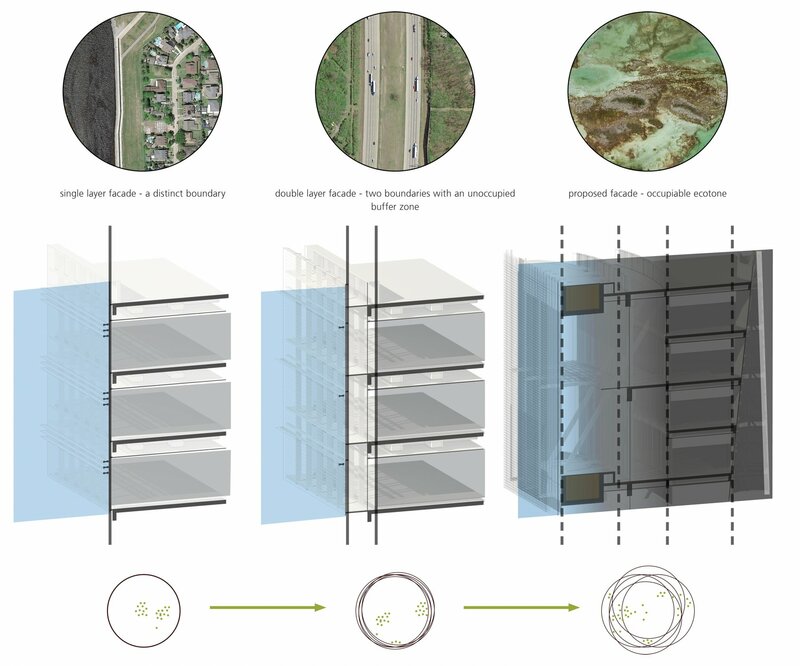 This submission proposes an ecotone - a highly-spatialized facade that creates a diverse community of occupiable spaces that work in concert to blend and integrate “exterior” and “interior” environments, in turn offering a variety of micro-climates. 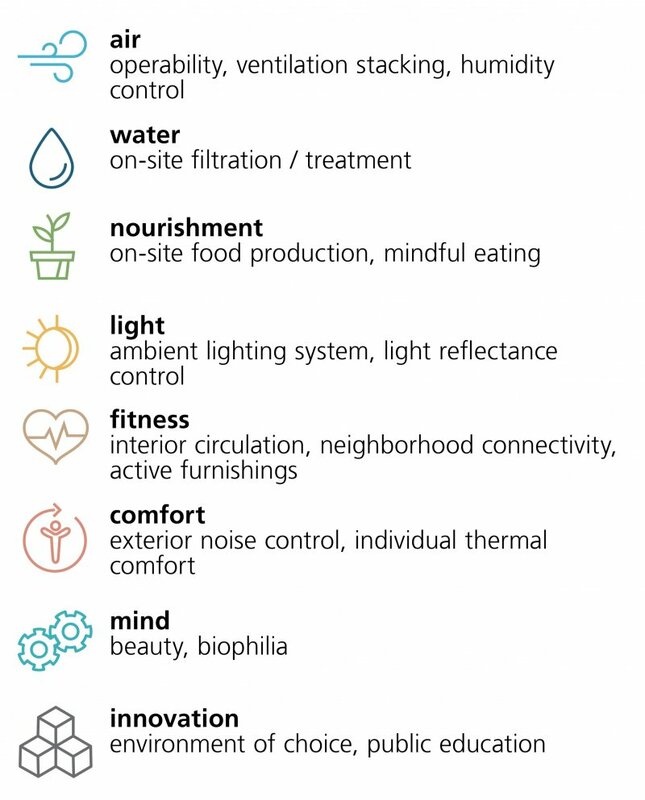 Knowing that occupant health and satisfaction are driven by a heterogeneity of conditions and choice in comfort, we offer a heterogeneous collection of zones with varying degrees of atmospheric conditions. People are dynamic, so their workspace should be as well. We saw these conditions changing with the seasons as well, with distinct conditions between summer and winter. 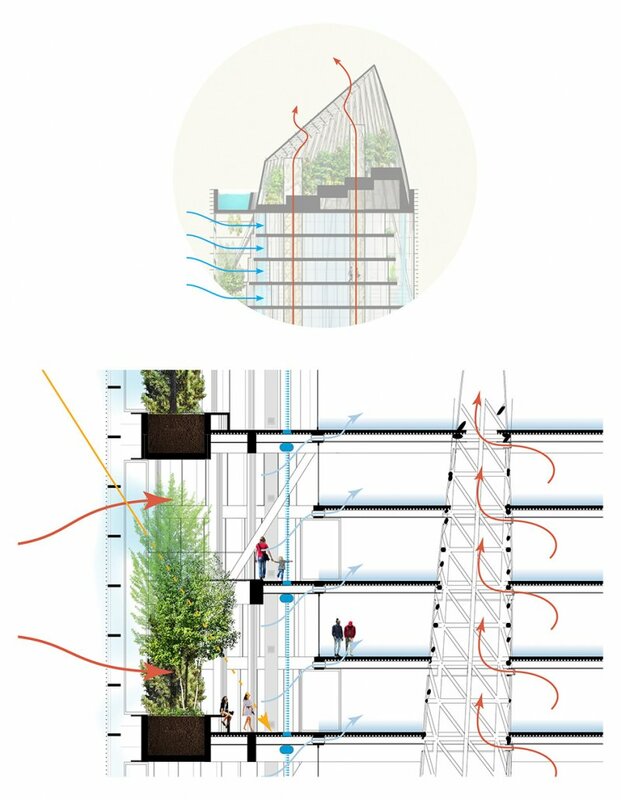 Sun - the south-facing exposures are shielded from solar heat gain by deciduous plantings along the edge of the building. 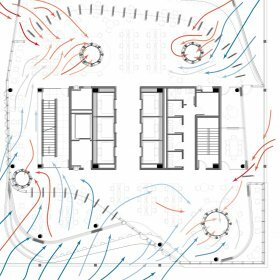 Ventilation - outside air is initially evaporatively-cooled as it passes through a misting mesh and a layer of open pivoting glazing into the planted zone. It then passes freely through openings in sliding partitions into a zone where falling cold water further cools and dehumidifies the air. Finally, the pre-conditioned air passes through a series of water source heat pumps above the innermost layer of glazed pivot doors where it is cooled to its final temperature and delivered via floor registers to the level above. The summer winds from the south maintain positive pressure to keep the outside air moving through the system. Exhaust - warm stale air is drawn up into the large rooftop greenhouse through exhaust tubes. Here, operable panels in the roof are in the open position allowing the naturally-treated air to pass through the jungle and into the atmosphere. 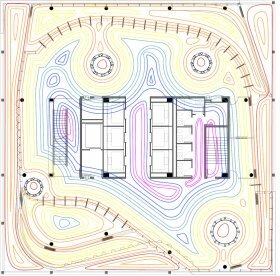 Cooling - radiant cooling provides comfort to lessen the demand for over-cooled air. 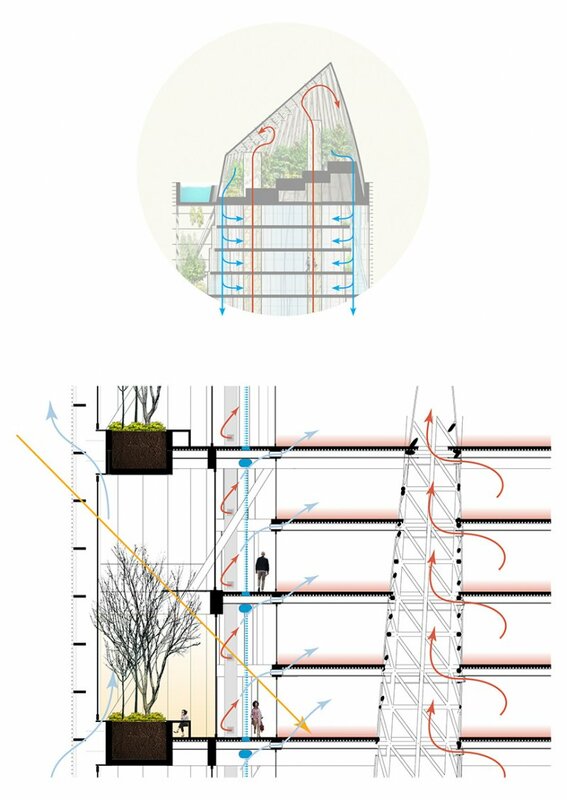 Sun - the perimeter layer of pivoting glass and the sliding panels separating the planted zone from the waterfall zone are both closed, transforming the planted zone into a passively-heated insulating solarium. A small amount of outside air is allowed to flow behind the pivoting glass panels to maintain circulation in this zone. Exhaust and Ventilation - the greenhouse’s operable roof panels are closed, and the exhaust air re-circulates in the greenhouse where its lush vegetation oxygenates and cleans the recycled air. Additional oxygen is added and pre-conditioned as necessary to supplement. The warm moist air from the greenhouse is then pumped by fan into the passive-dehumidification waterfall zones on each floor, de-humidified and temperature-adjusted by the cold water. It then moves through heat pumps back into the interior zone similar to the summer condition. Heating - radiant heating provides comfort to lessen the demand for over-heated air. The human body is exceptionally durable, and this durability affords a wide range of comfort. However, within our interior spaces we treat the body as if it were quite delicate – setting the thermostat to 72F year-round and isolating interior conditions from the exterior environment. This causes problems that dramatically impact our health, such as poor air quality. More importantly, it homogenizes the range of environmental and ecological conditions that creates so much pleasure when in the outdoors. Instead of creating environments where 80% of people are “satisfied,” create environments where people can find pleasure in their own individually selected workspace. In considering health and the human experience, we integrated our proposal with the WELL building standard. 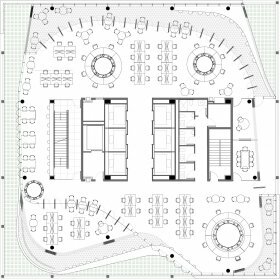 The key components focused on throughout the design are noted under the WELL concepts at right, and integrations considering these components were interspersed throughout plans, sections, and site diagrams. The project is located in Brooklyn, New York, directly outside the rapidly-evolving Brooklyn Navy Yard and adjacent to the East River. 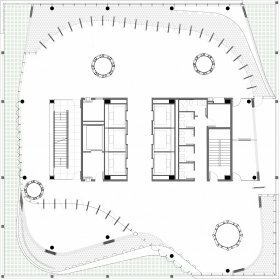 The modest building footprint allows for ample public spaces along the river and an integration of the bike path and urban context to the west. 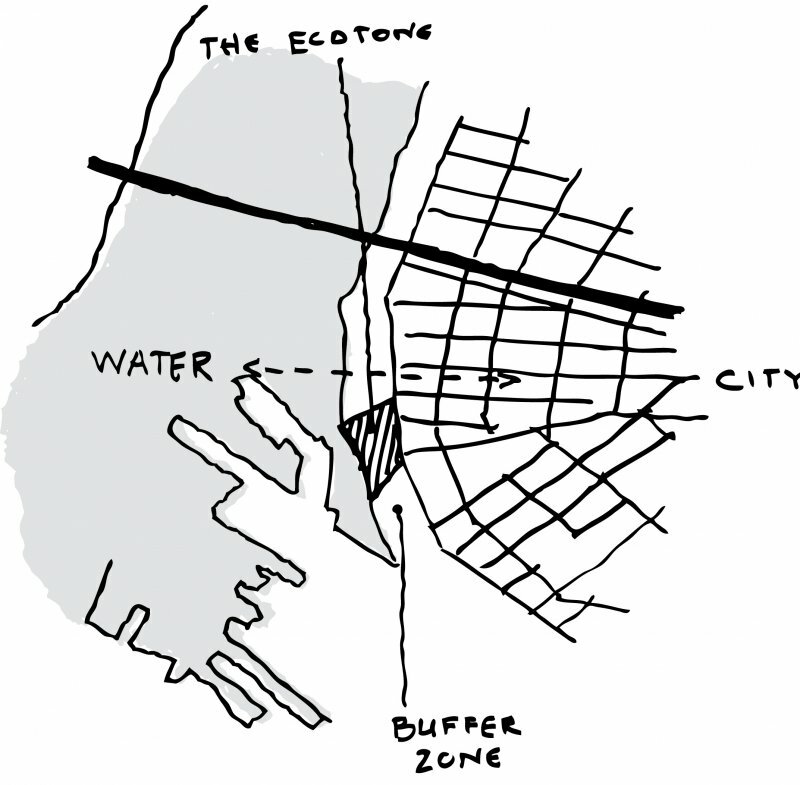 As with the building itself, the integration of the “water” and “city” contexts creates an ecotone on the site. The public bike path and boardwalk weave the city ecosystem into the pool and water treatment amenities of the riverine ecosystem. As with building occupants in the tower, visitors move through different environments and can enjoy a variety of spaces and activities across the site.